America Revealed: The Future Expansion of Unmanned Drones Over The U.S. 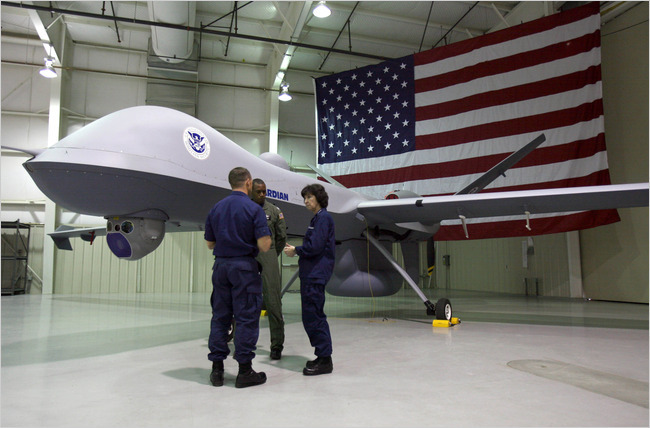 The Future Expansion of Unmanned Drones Over The U.S. In a stark admission, two-star General, John Priddy, from the U.S. National Air Security Operations Center, confirmed in the video below that the continued expansion of predator drone surveillance is a stated goal for the coming years. His comments were echoed by Al Palmer, Director of Unmanned Aircraft Training at the world's largest center at the University of North Dakota, "The world is going to spend $80 billion on unmanned aircraft between now and 2016." The idea for predator drone surveillance of Americans was kept under wraps until fairly recently. Even after a 2007 local news station in Texas captured drone flight tests on video, it was roundly denied as conspiracy theory that unmanned drones would actually take flight over America. Further investigation revealed that this flight test coincided with a plan already in place to patrol far inland beyond the legal 100-mile security border, also known as the Constitution-free Zone. Then, early this year, Miami-Dade county openly admitted to ordering a 16-pound T-Hawk micro drone which clearly indicates a move to miniaturize surveillance in order to bring it right into the streets of America, rather than the continued military propaganda stating that unmanned drones will be used only for border control operations. As Dana Gabriel and others have covered, Canada and the U.S. have formed a clear perimeter security and trade alliance which for all practical purposes removes the border between the two countries, thus allowing for drones to go beyond the previous 16-kilometer buffer zone and continue right to the border of Canada. This ultimately allows for coast-to-coast surveillance. Now that we know that "the ultimate goal" is 24-hour eye-in-the-sky surveillance by predator drones within civilian airspace from coast to coast, do we believe General Priddy when he asserts that this technology will be applied to "search and rescue" missions during natural disasters? Or, rather, should we be asking if the next logical step is for these drones to be weaponized?